Metal-on-metal (MOM) hip articulations were reintroduced several years ago but have recently been subjected to intense discussions due to reported re-operations and adverse tissue reactions. The recent generation of MOM articulations developed showed initially superior resistance to wear and raised hope of less re-operations, specifically in younger patients with increased activity and longer life expectancy . In addition, MOM articulations could provide superior range of motion because of better resemblance to hip anatomy, a normalized gait pattern as well as better stability with reduced dislocations and decreased impingement symptoms [2, 3]. MOM was on this background reintroduced and several short and middle term studies of the MOM articulation showed promising results with few re-operations [4-11]. Recently though, information on adverse tissue reactions and high re-operation rates have emerged [12-25]. This leads to the issue of a Medical Device Alert by the Regulatory Agency in the UK in 2010 and the recall of certain articulations from the marked [26, 27]. Several MOM articulations are still produced and sold for implantation but with conflicting research data accumulating regarding adverse reactions, as well as evidence of high re-operation rates, it is imperative to gather further data on the follow up results of patients receiving MOM articulations. The Conserve® MOM articulations are still sold and in use. The Conserve® MOM resurfacing articulations have been thoroughly investigated but the Conserve® MOM TOTAL hip articulation (MOM THA) only sparse and with conflicting results. [12, 28-36]. To disclose any irregularities in the use of this prosthesis, further investigation of patients receiving the Conserve® TOTAL hip articulation, is required. The aim of this study was to evaluate the implantation of the MOM THA from a single manufacture (Wright Medical Technology, Inc. (WMT), Arlington, TN). Patients receiving this articulation had at time of retrospective evaluation their journals reviewed to identify re-operation rates and adverse reactions around the implanted articulation. The study conducted was a retrospective study consisting of a cohort of 92 people with insertion of 108 MOM THA. Between November 2005 and December 2010 MOM THA articulations from a single manufactory (Wright Medical Technology, Inc. (WMT), Arlington, TN) were used as prosthesis for total hip arthroplasty at The Department of Orthopeadic Surgery at The Regional Hospital in Viborg and at The Department of Orthopeadic Surgery at The Regional Hospital in Thy. Through the Danish National Hip Register 108 MOM THAs, inserted during this period in 92 patients, were identified at time of retrospective evaluation and patients had their journals reviewed for re-operations and adverse reactions. Adverse soft tissue reactions were classified according to Hauptfleisch J et al. description of pesudotumors . 32 patients had their operation conducted at The Department of Orthopaedic Surgery at The regional hospital in Viborg and 60 patients at The Department of Orthopaedic Surgery at The regional hospital in Thy. The indication of insertion of MOM THA was active men or women. Patients chosen to receive a MOM THA included 58 males and 34 females with a mean age of 51.3 years (Table 1) 57 right and 52 left hips were inserted. Primary and re-operation were conducted through a posterior approach in laminar air-flow operating rooms. Stability was evaluated perioperative and patients were post-operational treated with prophylactic antibiotics. The prosthesis used was the MOM Conserve® TOTAL Hip System with BFH®(Big Femoral Head) Technology and is produced by Wright Medical Technology, Inc. (WMT), Arlington, TN (Fig. 1). The THA consist of four components. An acetabular cup, a femoral head, a neck and a femur stem. Parts are composed of a high carbon, cast cobalt chrome materials that should provide them with high strength and wear resistance. We used the A-CLASS® Advanced Metal with BFH® Technology as femoral head. As acetabular cup, the Conserve® Acetabular Cup designed to match different femur stems was used. The non-cemented, press fit component, Profemur® was utilized as the femur stem and the Profemur® Modular Neck Technology utilized as the neck component with different optional lengths allowing the surgeon to insure the correct length of the leg. Re-operation of the MOM THA was regarded as the primary parameter and defined by operation of the MOM THA performed in the operation theatre by a surgeon due to complications with the inserted MOM THA. Follow up was performed in accordance with the recommendations from the Danish Orthopaedic Society . Between 2005 and 2010 the general recommendations of patients with total hip articulations were followed . Measurement of Co. and Cr. ion levels were therefore not conducted during this period. During first half of 2012 the awareness about complications regarding the MOM THA became more apparent and patients with a MOM THA were scheduled for clinical evaluation by a senior surgeon and enrolled in the MOM follow up program. This included clinical evaluation, blood samples and radiological evaluation at 1,2,5,7,8 and 10 years after insertion . Metal-on-metal CONSERVE® TOTAL hip system. Results were reported as means using standard deviation, 95 % confidence intervals and p-values when relevant. Kaplan-Maier survivorship analysis was conducted on all hips, which had performed re-operation. For statistical analysis we used Intercooled Stata 9.0 (StataInc, College Station, TX). The mean follow-up period was 53 month (SD: 11.5 and range: 7-76) and at the time of retrospectively evaluation 20 hips where found to have required re-operation. Different reasons for re-operations were diagnosed: aseptic cup loosening, (n = 7), pain (n = 5), infection (n = 2), aceptic loosening of the stem (n = 1), dislocation (n = 1), ectopic bone (n = 1), elongation of leg (n = 1) and postoperative bleeding (n = 1) (Table 2). Revisions had a total failure rate of 18,5% (CI: 0.12 – 0.26) where men presented with a 19.4% (n =13/67, CI: 0.1 – 0.29) re-operation rate and women with a 17.1% (n=7/41, CI: 0.056 – 0.29) re-operation rate. No statistical significance difference was detected between the two groups (p-value: 0.76). The mean age at insertion of the MOM THA was 51.4 years and the overall mean time to revision was 18.7 months. Two adverse reactions were reported by the surgeons in the operating theatre and described as located in the area around the implanted component. One was a pseudotumor previously diagnosed using MRI and the other, a suspected pseudotumor found during operation with no previously diagnosis from ultrasound or MRI. No histology analyses were conducted to exclude or document adverse tissue reactions. MRI results were available from 8 patients and pseudotumors were diagnosed in 4 of these. One pseudotumor was classified as a type I with a cystic wall thickness of 3 mm. A second was diagnosed as a type II and a third described as small with no further classification. The fourth was characterized as “widely spread” but not with further details given. Only the “widely spread” pseudotumor was at retrospective evaluation re-operated. The other three hips presenting with pseudotumors are all being followed closely at the out patients clinic. Evaluation of the radiographs documented no hips with sign of adverse reactions. Self reported pain was observed in 3 cases (n =3/108) a side from the people previously receiving revision. These patients were enrolled to receive extended clinical control and were to be followed on a more frequent basis in the out patients clinic. Our results originate from two hospital centres where senior hip surgeons apart from two cases performed the operations. Apart from three re-operations, the re-operations were performed by one senior surgeon at The Department of Orthopeadic Surgery at The Regional Hospital in Viborg. Three re-operations were conducted in Thy and one at other hospitals. We had full access to all the patient’s journals. The Kaplan-Meier survivorship analysis conducted estimated a survivorship of the Conserve® MOM THA to 96% at 1 year, 93% at 3 year and 88 % at year 8. End point was defined as re-operation of the MOM THA (Fig. 2). Kaplan-Meier survivorship of the implanted THA. Re-operation was defied as failure. MOM THA was reintroduced several years ago and has recently been subjected to intense debate. Promising results were initially shown using the MOM THA but recently studies have disputed this and accumulating research have been reported presenting high re-operation numbers and adverse reactions. In present study, we report on a high re-operation rate of 18,4% at a mean follow up of 53 months using the Conserve® MOM THA. There are several limitations correlated with this retrospective study. Loss to follow up of patients and sectional biases in election of patients to receive the MOM articulation. The suggested correlation with the metal sensitivity in the literature and the debris of the MOM THA was not apparent before years after initiation of usage of the Conserve® MOM THA. Therefore, we have inconsistencies in blood ion sample collection, making analysis of these results impossible. X-rays of the pelvis was not conducted on a regulatory basis before re-operation and we have therefore not been able to investigate the inclination and the anteversion of the prosthesis effect on articulation failure. Short and middle term studies have investigated MOM THA, from different manufactures, with conflicting results. Several studies have produced promising results with low re-operation rates ranging from zero to a few percent while other have identified high re-operation rates between 15-30% [4-9]. The Conserve® resurfacing articulation has been intensively investigated and produced remarkable results with survival percentages reaching 90% in middle and short-term studies [28-34, 36]. The Conserve® TOTAL MOM THA has only, to our knowledge, been investigated in few studies. A one year follow up study found no re-operations of the articulation while another study by Levy YD et al. reported on the short-term outcome of 78 consecutive implanted MOM THA with a mean follow up period of 1.3 ±1 years [12, 35]. This study showed a re-operation rate of 15.4%. Our study of insertion of 108 Conserve® TOTAL MOM THA on 92 patients showed a re-operation rate of 18,4% divided on 17,1% for women and 19,4% for men with a mean follow up period of 53 month. 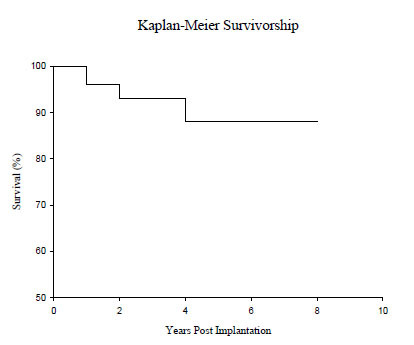 The Kaplan Maier survivorship analysis predicted a survivorship of the Conserve® MOM THA on 88 % at 8 years (Fig. 2). No statistical significant difference regarding re-operation rates in women or male patients was found. This is not in accordance with the literature on MOM THA where studies have shown significant higher re-operation rates in women [36, 40]. Our results correlate with the high revision rates previously found in other studies and our study is largely comparably to these. Introduction of a new implant and the “learning curve” associated with this could explain some of the re-operations but can surly not account for the total amount of re-operations. Table 2 lists several reasons of re-operations but our study failed to provide a control group and on this background it is difficult to conclude on these specific reasons of articulation failure. The high re-operation rates encountered and the subsequently failure to appropriately treat patients, raised concern about the use of the MOM THA and subsequently lead to the termination of implantation of the MOM THA at the two orthopaedic departments. Several different failures of the articulations were documented as cause of re-operation in our study with aseptic loosening and pain listed as the most abundant failures (Table 2). In MOM THA clinical failures and pain have been associated with reported adverse reactions in tissue around the articulation [12, 20-22]. The definition of the adverse reactions in MOM hip articulations is subject to an on going discussion. No consensus has been reached but several terms are currently in use. These include: Metallosis , pseudotumors , aseptic lymphocytic vasculitis-associated lessions (ALVAL) , adverse reactions to metal debris (ARMD)  and adverse local tissue reactions (ALTR) . These all describe different aspects or stages in the development of soft and bone tissue reactions around the hip. A study reported on pseudotumors in 28 % of hips after an average follow up of 41 months using the Birmingham Hip Resurfacing Prothesis . Another investigation of the Conserve® TOTAL MOM THA showed pseudotumors diagnosed in 40% of the re-operations at a mean follow up of 1,3 years . In present study, two pseudotumors were suspected during surgery but no tissue was sent to histology test. No other adverse tissues reactions were identified during surgery. Pseudotumors were diagnosed around 4 articulations of our patients after MRI scanning’s. Of these articulations, one was re-operated at the time of retrospective evaluation. The additional 3 were followed closely in the out patient clinic. We have on this background not substantiated any link between adverse reactions and re-operations in our study. Groin pain has in the literature been correlated with adverse reactions around MOM THA and has in addition been mentioned as a first predictor of the Conserve® TOTAL MOM THA failure [12, 41]. We found, in accordance with this, pain preoperative in all MOM THA re-operated. At the time of retrospective evaluation, additional three patients presented with groin pain at time of follow up. In conclusion, we found a re-operation rate of 18.4% in present study. Only few of these re-operations were correlated with adverse reactions and did not substantiate a sure link between these two. We can on the basis of present data, not firmly conclude on the reasons of articulation failure but because of the high revision rate encountered the departments stopped using the MOM articulation. To further disclose and determine re-operations and possible adverse reactions related to this articulation further investigation of this MOM THA is necessary. Wrote or contributed to the writing of the manuscript: Simon Limbrecht Mogensen, Thomas Jakobsen and Niels Krarup. The authors greatly appreciate the help by Inger Holm in collecting MRI results. Goldsmith AA, Dowson D, Isaac GH, Lancaster JG. A comparative joint simulator study of the wear of metal-on-metal and alternative material combinations in hip replacements. Proc Inst Mech Eng H 2000; 214(1): 39-47. Quesada MJ, Marker DR, Mont MA. Metal-on-metal hip resurfacing: advantages and disadvantages. J Arthroplasty 2008; 23(7)(Suppl. ): 69-73. Haddad FS, Thakrar RR, Hart AJ, et al. Metal-on-metal bearings: the evidence so far. J Bone Joint Surg Br 2011; 93(5): 572-9. Lombardi AV Jr, Mallory TH, Alexiades MM, et al. Short-term results of the M2a-taper metal-on-metal articulation. J Arthroplasty 2001; 16(8)(Suppl. 1): 122-8. Delaunay CP. Metal-on-metal bearings in cementless primary total hip arthroplasty. J Arthroplasty 2004; 19(8)(Suppl. 3): 35-40. Lombardi AV Jr, Mallory TH, Cuckler JM, Williams J, Berend KR, Smith TM. Mid-term results of a polyethylene-free metal-on-metal articulation. J Arthroplasty 2004; 19(7)(Suppl. 2): 42-7. Dorr LD, Wan Z, Longjohn DB, Dubois B, Murken R. Total hip arthroplasty with use of the Metasul metal-on-metal articulation. Four to seven-year results. J Bone Joint Surg Am 2000; 82(6): 789-98. Fink Barnes LA, Johnson SH, Patrick DA Jr, Macaulay W. Metal-on-metal hip resurfacing compared with total hip arthroplasty: two to five year outcomes in men younger than sixty five years. Int Orthop 2014; 38(12): 2435-40. Innmann MM, Gotterbarm T, Kretzer JP, et al. Minimum ten-year results of a 28-mm metal-on-metal bearing in cementless total hip arthroplasty in patients fifty years of age and younger. Int Orthop 2014; 38(5): 929-34. Sturup J, Dahl LB, Jensen KE, Larsen AB, Gebuhr P. Few adverse reactions to metal on metal articulation in total hip arthroplasty in a review study on 358 consecutive cases with 1 to 5 years follow-up. Open Orthop J 2012; 6: 366-70. Bernasek TL, Polikandriotis JA, Levering MF, Dalury DF, Fisher DA, Adler MJ. Five- to ten-year outcomes for modular metal-on-metal total hip arthroplasty. J Arthroplasty 2013; 28(7): 1231-4. Levy YD, Ezzet KA. Poor short term outcome with a metal-on-metal total hip arthroplasty. J Arthroplasty 2013; 28(7): 1212-7. Long WT, Dastane M, Harris MJ, Wan Z, Dorr LD. Failure of the durom metasul acetabular component. Clin Orthop Relat Res 2010; 468(2): 400-5. Dramis A, Clatworthy E, Jones SA, John A. High failure rate of the R3 metal-on-metal total hip arthroplasty. Hip Int 2014; 24(5): 442-7. Bjorgul K, Novicoff WN, Andersen ST, et al. High rate of revision and a high incidence of radiolucent lines around Metasul metal-on-metal total hip replacements: results from a randomised controlled trial of three bearings after seven years. Bone Joint J 2013; 95-B(7): 881-6. Bernthal NM, Celestre PC, Stavrakis AI, Ludington JC, Oakes DA. Disappointing short-term results with the DePuy ASR XL metal-on-metal total hip arthroplasty. J Arthroplasty 2012; 27(4): 539-44. Lombardi AV Jr, Berend KR, Morris MJ, Adams JB, Sneller MA. Large-diameter metal-on-metal total hip arthroplasty: dislocation infrequent but survivorship poor. Clin Orthop Relat Res 2015; 473(2): 509-20. Matharu GS, Theivendran K, Pynsent PB, Jeys L, Pearson AM, Dunlop DJ. 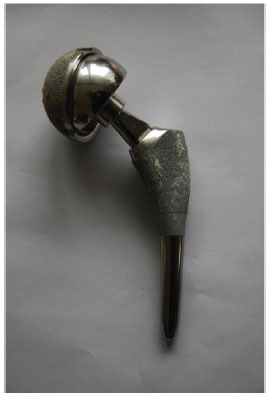 Outcomes of a metal-on-metal total hip replacement system. Ann R Coll Surg Engl 2014; 96(7): 530-5. Korovessis P, Petsinis G, Repanti M, Repantis T. Metallosis after contemporary metal-on-metal total hip arthroplasty. Five to nine-year follow-up. J Bone Joint Surg Am 2006; 88(6): 1183-91. Pandit H, Glyn-Jones S, McLardy-Smith P, et al. Pseudotumours associated with metal-on-metal hip resurfacings. J Bone Joint Surg Br 2008; 90(7): 847-51. Willert HG, Buchhorn GH, Fayyazi A, et al. Metal-on-metal bearings and hypersensitivity in patients with artificial hip joints. A clinical and histomorphological study. J Bone Joint Surg Am 2005; 87(1): 28-36. Junnila M, Seppänen M, Mokka J, et al. Adverse reaction to metal debris after Birmingham hip resurfacing arthroplasty. Acta Orthop 2015; 86(3): 345-50. Perino G, Ricciardi BF, Jerabek SA, et al. Implant based differences in adverse local tissue reaction in failed total hip arthroplasties: a morphological and immunohistochemical study. BMC Clin Pathol 2014; 14: 39. Bisschop R, Boomsma MF, Van Raay JJ, Tiebosch AT, Maas M, Gerritsma CL. High prevalence of pseudotumors in patients with a birmingham hip resurfacing prosthesis: a prospective cohort study of one hundred and twenty-nine patients. J Bone Joint Surg Am 2013; 95(17): 1554-60. Medial Device Alert. England. Available at: http://www.jisrf.org/pdfs/mediacl-device-alert.pdf 2010. Amstutz HC, Le Duff MJ, Campbell PA, Dorey FJ. The effects of technique changes on aseptic loosening of the femoral component in hip resurfacing. Results of 600 Conserve Plus with a 3 to 9 year follow-up. J Arthroplasty 2007; 22(4): 481-9. Amstutz HC, Le Duff MJ. Eleven years of experience with metal-on-metal hybrid hip resurfacing: a review of 1000 conserve plus. J Arthroplasty 2008; 23(6)(Suppl. 1): 36-43. Amstutz HC, Takamura KM, Le Duff MJ. The effect of patient selection and surgical technique on the results of Conserve® Plus hip resurfacing--3.5- to 14-year follow-up. Orthop Clin North Am 2011; 42(2): 133-42. [vii.]. Hulst JB, Ball ST, Wu G, Le Duff MJ, Woon RP, Amstutz HC. Survivorship of Conserve® Plus monoblock metal-on-metal hip resurfacing sockets: radiographic midterm results of 580 patients. Orthop Clin North Am 2011; 42(2): 153-159, vii. Woon RP, Johnson AJ, Amstutz HC. Results of Conserve Plus® metal-on-metal hip resurfacing for post-traumatic arthritis and osteonecrosis. Hip Int 2012; 22(2): 195-202. Zylberberg AD, Nishiwaki T, Kim PR, Beaulé PE. Clinical results of the conserve plus metal on metal hip resurfacing: an independent series. J Arthroplasty 2015; 30(1): 68-73. Nam D, Maher P, Rebolledo BJ, Su EP. A comparison of two resurfacing arthroplasty implants: medium-term clinical and radiographic results. Hip Int 2012; 22(5): 566-73. Lardanchet JF, Taviaux J, Arnalsteen D, Gabrion A, Mertl P. One-year prospective comparative study of three large-diameter metal-on-metal total hip prostheses: serum metal ion levels and clinical outcomes. Orthop Traumatol Surg Res 2012; 98(3): 265-74. Jameson SS, Baker PN, Mason J, Porter ML, Deehan DJ, Reed MR. Independent predictors of revision following metal-on-metal hip resurfacing: a retrospective cohort study using National Joint Registry data. J Bone Joint Surg Br 2012; 94(6): 746-54. Hauptfleisch J, Pandit H, Grammatopoulos G, Gill HS, Murray DW, Ostlere S. A MRI classification of periprosthetic soft tissue masses (pseudotumours) associated with metal-on-metal resurfacing hip arthroplasty. Skeletal Radiol 2012; 41(2): 149-55. Danish Orthopeadic Society. Available at: http://www.ortopaedi.dk/fileadmin/Guidelines/Referenceprogrammer/THA-referenceprogram.pdf 2006. Danish Orthopeadic Society.Metal-on-Metal hip articulation follow up program. Available at:http://www.ortopaedi.dk/fileadmin/Guidelines/ Referenceprogrammer/Udredningsprogram_MoM_DSO_DSHK_2-3-2012.pdf 2012. Glyn-Jones S, Pandit H, Kwon YM, Doll H, Gill HS, Murray DW. Risk factors for inflammatory pseudotumour formation following hip resurfacing. J Bone Joint Surg Br 2009; 91(12): 1566-74. Bartelt RB, Yuan BJ, Trousdale RT, Sierra RJ. The prevalence of groin pain after metal-on-metal total hip arthroplasty and total hip resurfacing. Clin Orthop Relat Res 2010; 468(9): 2346-56.